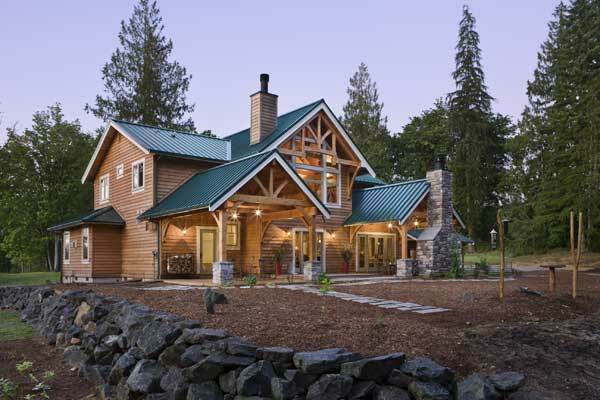 A Washington State couple finishes a timber frame home themselves, saving money and offering a world of satisfaction. Located on 20 acres of forested land in Washington state, Joan Hurst and Terry Gentry's home has the warm, welcoming air of a country lodge. There are many ways to make a new home feel like it's truly your own: through the design, the details or the furnishings. When Joan Hurst and Terry Gentry built their striking, 4,000-square-foot timber home on 20 wooded acres in Washington State, they paid careful attention to all of the above. But they also took psychological ownership another way. They tackled much of the finishing work themselves. They stained the cedar siding, painted the interior walls and designed and built a distinctive loft railing out of electric conduit. "It's our house," says Joan with quiet pride. "We didn't just buy someone's home. We built our home." The process started early. Joan and Terry bought their land in 1999 and spent several years figuring out exactly what they wanted to build. After considering a log home, they settled on timber-frame construction. "We just fell in love with the look of it," says Terry, "the mortise-and-tenon joints and pegs and beams—the whole thing." The couple clipped articles and photos from magazines that captured ideas they liked. They even bought a computer program that allowed them to play with 3-D architectural designs. Builder Rick Stockmann of Specialty Built Construction in Bellevue, Washington, entered their lives after they saw his ad in a magazine. It quickly became apparent to Rick that Joan and Terry had developed a solid instinct for what they wanted and how to get it. "They started pulling out articles and pictures of things that they liked," Rick remembers, "and it was funny. I said, 'Those are my homes.' They were projects we had done." "We knew then that we had the right builder," Joan says, laughing. Joan and Terry worked with Specialty Built Construction's architect to refine their ideas. In the process, the house grew with the things they'd long dreamed of having. "We put in everything we wanted," says Terry. The result is a home with only two bedrooms but an exercise room, a hobby room, a library and a game room above the garage. Although the space abounds with interesting architectural detail, starting with the elaborate roof trusses, the soaring and light-filled great room gives it a feeling both of openness and simplicity. Okanagan Timber Frame Company, based in Salmon Arm, British Columbia, supplied the timber-frame package. The company uses standing-dead timber and operates its own sawmill. Its staff also includes German master carpenters, one trained in gothic 17th-century designs. "We're coming up with some amazing designs for our frames, more of a European style," says Todd Roberts, company president. The package for the Hurst-Gentry home included Douglas fir timbers harvested from a fire kill, which gave the wood great structural rigidity and a clean appearance. "It turned out exceptionally well," Todd says. Rick has used Okanagan for every timber home he's built over the past eight years. "They're not a volume fabricator," he says, "and so they're really on top of their quality control, from the choice of timbers to the finished products." Rick also appreciates Okanagan's commitment to green building, something he emphasizes at his own company. Specialty Built Construction, in business since 1997, builds between 12 and 16 custom homes per year, most of which are timber frame. "It's what I love to do," says Rick. "To me, timber homes are spiritual. The exposed wood gives them a different feeling. Stand inside them, and I swear you feel a new energy in life." And it's his company's dedication to energy efficiency that has garnered green-building awards. The Hurst-Gentry home uses radiant heating on the main floor that, because of insulation and interior design, heats the entire house. It's an example of the successful collaboration between owners and builder: Joan and Terry had radiant heating in mind, so Specialty Built Construction made it work for the whole house. "Joan and Terry were just remarkable," Rick says. "They had a game plan coming in and could make decisions quickly. It really helps the building process when you have owners like that." He also respected their desire to do some of the work themselves. "I thought it was great. They were careful to do it in ways that didn't interfere with the timeline for overall construction," Rick says. "And they saved themselves thousands of dollars." And in the process, placed the final stamp of ownership on an already distinctive home.